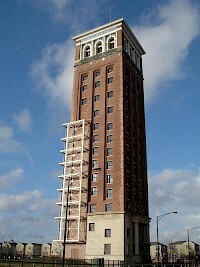 The Sears Merchandise Building Tower is a small part of a building that was used by Sears as a retail headquarters and distribution center for what was the largest catalog retailer in the United States. Officially opened in 1906 it was the 40-acre home of Sears, Roebuck & Co., Chicago. The 3.3 million ft² office building attached to the tower was later demolished. It was the headquarters and main operations for all parts of the Sears Roebuck Company for almost seven decades.